In general, our most popular Digital Systems Blog posts in 2018 highlighted trends and technologies specific to smart lighting and the Internet of Things (IoT). 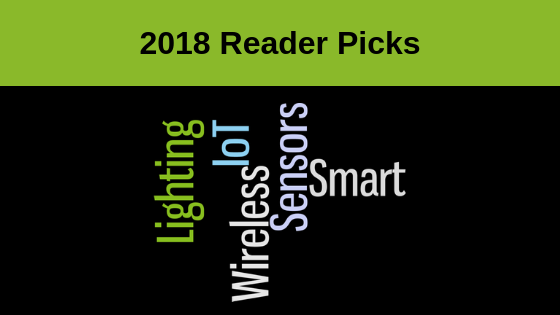 More specifically, readers gravitated to articles relating to the technology infrastructure for IoT applications to learn more about sensors, lighting controls, wireless communication, networking and more. Our readers are at the forefront of change and their reading taste reflects that. Let’s take a closer look. Each of our top 5 commercial lighting trends listed for 2018 have broad impact across the commercial lighting industry. Each highlights how technology-driven the industry has become and indicates the direction we see lighting systems take as part of the broader smart building and IoT world. Smart lighting is playing a pivotal role, unlocking the power of the IoT and smart building applications. Lighting is ubiquitous throughout all buildings and every luminaire connects to a power source. It is the perfect conduit for collecting data on what is happening in the building at any given time. In this article, you will learn what the Internet of Things (IoT) is and what smart lighting has to do with it. Why have a wireless integrated sensor in every luminaire? This technology is a key part of a smart lighting solution and also a critical piece of the enabling infrastructure for IoT. The benefits are many from both a current and future perspective. How will luminaires, sensors and controls connect and reliably communicate with each other on your smart lighting network? Does this sound complicated? It really isn’t, but understanding a few basics before you get started is essential. In this article, we focus on two major decisions you will need to make -- the system architecture and the communications protocol. Selecting an infrastructure that will support the IoT can be an overwhelming task. There are still many unknowns about what the exact requirements will be and no one wants to make an investment mistake. In this article, we highlight 5 tips in choosing an intelligent lighting system infrastructure as your platform for IoT.